← George Zimmerman is no angel? Really? UPDATED! It is amazing how the elite media hid this for so long, but as Winston Churchill said, “A lie gets half way around the world before the truth can get its pants on”. 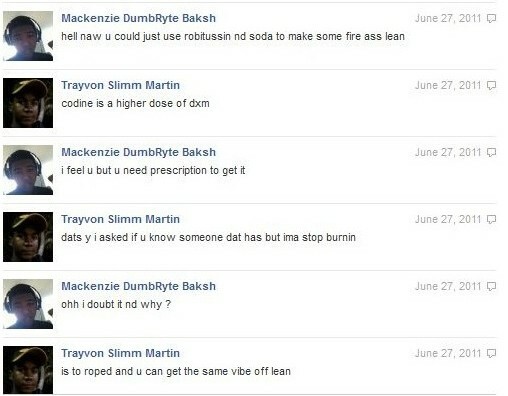 Lean – it is a street drug popular with the “gangsta rap” scene and one of the more popular recipe’s is Robitussin DM, Watermelon flavored Arizona Tea and Skittles. Guess what kind of tea Trayvon Martin bought at 7-11 along with his Skittles. It’s more than a drug; it’s a culture. It’s what’s known on the street as “Lean,” a highly addictive cocktail of cough syrup, cold medicine, alcohol and candy — so potent it makes you “lean” over when high. The drug first began to get attention a few years ago, when a popular Houston DJ overdosed on it. At that time, it was easy to make and easy to get, says Ron Peters, a professor at the University of Texas School of Public Health. “As far as across Texas, across also the southern part of the United States, estimates have shown that it to be at one time a pretty common drug of choice amongst kids…anywhere from ninth grade all the way up to young adults,” says Peters. Martin had 1.5 nanograms of THC – the active ingredient in marijuana – and 7.3 nanograms of another THC substance found in his blood. Traces of cannabis – marijuana – were also found in his urine. What causes patchy yellow discoloration due to fatty metamorphosis of the liver? Well, morbid obesity, Reye’s Syndrome, alcohol addiction, and drug abuse. George Zimmerman said in his call to police that Martin was behaving strangely like he was on drugs. This is the kind of trouble our inner city youth are in today and the elite media, Al Sharpton, Jesse Jackson and President Obama could not seem to care less. This entry was posted in Editorial, Elite Media, Gangsta Govt, Lies and tagged current-events, health, medicine, politics, society. Bookmark the permalink.